Boston police said today they want to interview the occupants of a white SUV captured on film by a city surveillance camera speeding away from Harlem Street in Dorchester moments after three women were fatally shot there Sunday night. “It’s a very unique vehicle,’’ Police Commissioner Edward F. Davis said today at a press conference at police headquarters that was attended by Mayor Thomas M. Menino. Police said the SUV had a black top, halogen lights, and fog lights. 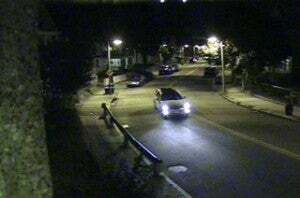 Anyone with information about the vehicle is asked to contact Boston homicide detectives. Police initially said two women had died in the shooting but announced this afternoon that a third victim had died. A fourth woman suffered injuries that were not considered life-threatening. The victims were all sitting in a car when the shooting broke out, officials said. Menino said he knows family members of at least two of the Harlem Street shooting victims, and he called on the community to assist police in solving what he called a “heinous’’ crime. The names and ages of the victims were not released by authorities, but relatives today identified one of the victims as Sharrice Perkins, a lifelong resident of Harlem Street. Steven Perkins said his daughter was attending college and was living with her three brothers. He was too distraught to talk about his daughter further. In 2007, Sharrice Perkins was part of a double dutch team – coached by Perkins’s mother, Angela Francis – who were planning to attend the American Double Dutch League World Invitational Championships in South Carolina that year. At the time, Perkins was 17. Davis said police are investigating a number of theories about the motive for the shooting, including the possibility that the women were shot because some of their relatives are gang-involved. However, he said, that has not been confirmed. Police do not believe the shooting was a random attack. They also do not believe that the shooting connected to last fall’s murders of two sisters inside their apartment at 50 Harlem St., he said. “I don’t think the killings are in any way connected,’’ Davis said. Last November, Stephanie Emile, 21, and her 23-year-old sister, Judith, were shot, allegedly by Jean Weevins Janvier, 30, who was previously involved in a romantic relationship with Stephanie Emile. Janvier is being sought by Boston police, the US marshal’s office, and other law enforcement agencies and is believed to have fled the country. On Harlem Street, long-time residents seemed in a state of shock this morning. Milton Roye, who has lived on the street near Franklin Park since 1958, said today that the violence in the area had become an unprecedented intrusion into a generally quiet neighborhood of single- and multi-family homes. “The worst it’s ever been,’’ said Roye. No arrests have been made in the shooting, police said. Police also continued to investigate a quadruple shooting near 784 Canterbury St. in Roslindale in which one man was killed. The shooting took place Sunday around 3 a.m., police said. Jemald Allen, 34, of Boston was pronounced dead at the scene. The other three victims, all men in their 20s, suffered injuries that were not life-threatening. Today the driveway of 784 Canterbury remained blocked with police tape. A police cruiser sat parked outside, and both officers inside declined comment on the investigation. A neighbor, who asked that her name be withheld for her safety, said she heard what sounded like a party Saturday night at the home, with loud music and people shouting. On the porch of the home, a bottle of what appeared to be alcohol rested next to two cans of pineapple juice. She described the neighborhood as generally calm, as did nearby resident Salvatore De Lorenzo. Holding a hose in a garden that included fig and lemon trees, the 72-year-old retired truck driver said people in the area get along well. Carol Celata, who also lives nearby, agreed. “Generally, this neighborhood’s pretty quiet,’’ she said. Police spokeswoman Cheryl Fiandaca said that one more person was shot Sunday night in the area of 156 Columbia Road in Dorchester. The person’s injuries were not life-threatening. The two Dorchester shootings Sunday night were not connected, she said. The shootings brought the number of homicides in the city to 33, compared with 34 at this time last year, police said. contact the Homicide Unit at 617-343-4470. People with information who wish to remain anonymous can call 1-800-494-TIPS or text the word ‘TIP’ to CRIME (27463).